Jumptools CRM helps you manage your Real Estate sales process and stay in touch with your sphere of influence. 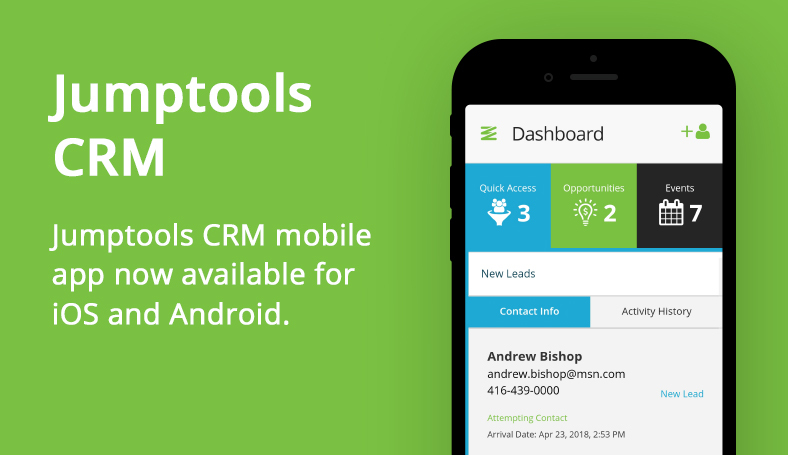 You’re always on the go, so we created the app to let you get the benefit of CRM on the road. You’ll be ready to respond to new leads in record time and stay focused on today’s most important appointments and tasks. The simple Dashboard keeps you on track with your most important people, open opportunities and today’s tasks. Met with a client? Log the activity on your phone in seconds. Received a referral? Add the new referral lead on the road. Your calendar now goes with you to help you stay organized and on top of your day. Log customer activities or create new contacts on the go. No network access? Work offline and we’ll sync everything up when you get connected again. Download the Jumptools CRM app on the Apple App Store or Google Play.